OLATHE, Kan./September 27, 2016/Business Wire – Garmin International Inc., a unit of Garmin Ltd. (NASDAQ: GRMN), today announced that for the second year in a row, it received the honor of being the most recognized company in the marine electronics field for its support of products in the field by the National Marine Electronics Association (NMEA). In addition to Manufacturer of the Year, Garmin also received seven Product of Excellence Awards in the following categories: autopilot, multi-function display (MFD), mobile application—aid to navigation, mobile application—utility, fishfinder, AIS, and multimedia entertainment. The honors were announced at the prestigious 2016 NMEA Convention held last week in Naples, Fla.
For the fourth year in a row, Garmin received an award in the autopilot category for its GHP ReactorTM Hydraulic Autopilot with SmartPump. The GHP Reactor was Garmin’s first recreational autopilot system to utilize AHRS technology and boasts the usability, installation flexibility, and many other features that prove to be valuable for any vessel. Garmin also earned accolades in the MFD category, another consecutive honor. This year’s MFD award went to the GPSMAP® 8624, a 24-inch all-in-one chartplotter that boasts the highest screen resolution on the market. The GPSMAP 8624 comes preloaded with both BlueChart® g2 coastal and LakeVü HD inland maps, and is fully network compatible for support of radar, autopilot, instruments, multiple screens, sensors, remote sonar modules, digital switching, thermal cameras, and more. Smartphone applications are essential tools for mariners in today’s connected world, and Garmin’s mobile app offerings received top honors yet again in these categories. Garmin BlueChart Mobile, a route planning application with streaming weather capabilities, was named the best mobile application aid to navigation; and Garmin HelmTM, an application that allows mariners to view and control their chartplotter from a smartphone or tablet, won for mobile application utility. Other Garmin products recognized include the GSDTM 26 black-box sounder with broadband spread-spectrum signal technology in the fishfinder category, and the AIS 600, a blackbox transceiver that sends and receives vessel information and AIS target data in the AIS category. FUSION®, a Garmin brand, also won the new multimedia entertainment category for the AV750 Marine Stereo System that features a marine-ready DVD/CD player, Wi-Fi/Bluetooth connectivity and much more. 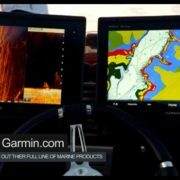 Garmin’s portfolio includes some of the industry’s most sophisticated chartplotters and touchscreen multifunction displays, sonar technology, high-definition radar, autopilots, highresolution mapping, sailing instrumentation and other products and services that are known for innovation, reliability and ease-of-use. About Garmin International Inc. Garmin International Inc. is a subsidiary of Garmin Ltd. (Nasdaq: GRMN). Garmin Ltd. is incorporated in Switzerland, and its principal subsidiaries are located in the United States, Taiwan and the United Kingdom. Garmin, GPSMAP, BlueChart and Fusion are registered trademarks and GHP Reactor, Garmin Helm and GSD are trademarks of Garmin Ltd. or its subsidiaries.